Pumpkin Banana Tart Serves 10. Preheat oven to 350. Pulse to blend ingredients for crust, press into sides and bottom of tart pan(s) (with removable bottoms if you have them). Bake 10 minutes then cool. Place gelatin in 1/4 cup water and set aside (tiny bowl). Heat and stir cream, pumpkin, brown sugar, cinnamon, nutmeg and salt in dutch oven/heavy saucepan over medium until hot, about 6-8 minutes. Whisk eggs in [another] bowl, adding small spoonfuls of hot pumpkin mix to warm up the eggs but not cook them. Stir slowly and continually. Once the egg mix is heated through, add into pan with pumpkin mix. Stir continually until heated and thickened, 5 minutes. Remove from heat. In [yet another] bowl, blend banana, gelatin mix and orange zest. Stir into pumpkin mix. Whip cream in chilled bowl (hey, how many bowls is that? ), adding sugar when peaks start to form. When you have firm peaks, fold into pumpkin mix and pour into tart pans. Chill at least 2 hours or overnight. Make dollops to top tarts by repeating whip cream procedure (in the last, chilled bowl), adding extract/cinnamon with the sugar. Whatever you do, resist the temptation to serve in bowls---you already filled that quota. 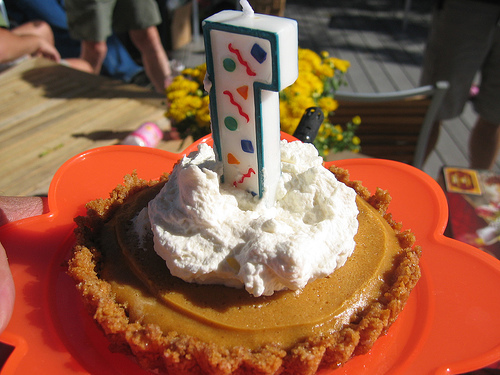 Nov 10 Pumpkin Cheesecake with Gingersnap Crust.